As the temperatures cool and the leaves begin to change I want to welcome in the Fall season by sharing some of the reasons why I fall fore golf. For starters, I enjoy being around the game so much that I made it my career. Someone once said about baseball that the real action happens between pitches, my interpretation is that they were speaking about the interaction of the spectators. Golf is virtually the same. I’ve found that you can spend hours with someone in a relaxed environment and learn more about a person in a round of golf than years spent during casual dinners and days in the office. There is a high amount of time between shots where you can learn about your playing companions. The game will bring out your true character, and you will see how you and other people act and react to challenging situations. 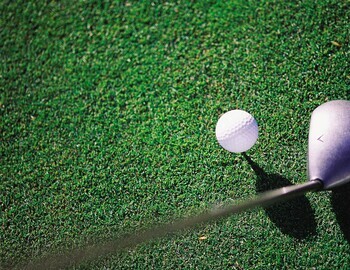 “Happiness is a long walk with a putter” – Greg Norman. Throughout the years I have enjoyed playing with many groups of people varying in age. When I was in my twenties I routinely played with people in their seventies. I was given advice and taught lessons that I apply in my life today. I’m hard-pressed to think of an activity where everyone can play together regardless of age, strength and natural ability. When I retire I want to play daily! Stroke play, match play, foursome, 2 v 2, four ball, the list goes on and on! One of the best things about the game of golf is that you can play with people that have different abilities and still come-up with a fair game. Even if they do not want to participate competitively, you are always competing against the course and yourself. The game cannot be mastered, even when you are playing well, in your mind you could always shave strokes off of your score. Hitting a great drive only to hit the worst approach shot of the day. It is amazing how often I routinely walk off a green shaking my head at what just happened, telling myself “you have to be kidding!” All I want to do is play the hole again because I know I can improve. Oh what a feeling, I’ve found the secret, God please let me be able to repeat it! It may be the only good shot I hit all day but I know I have it in me. “Can I clear the water hazard 250 yards away? Heck yes!” My reasoning – I’ve done it before, I can do it again. There’s simply no better feeling than when I hit the ball just right. Even if you play the same course every day it is never the same: course conditions change, the wind is different, the hole location is moved, and the hole length can be altered depending on weather factors. It is never the same, and unfortunately, neither is my swing.